Amtrak put its best face forward at Expo ‘74 held in Spokane, Washington during the summer of 1974. Following in the tradition of world’s fairs that had begun in the mid-19th century, the Expo focused attention on the nascent environmental movement through the theme of “Celebrating Tomorrow’s Fresh New Environment.” This seemed especially fitting as Amtrak ridership hit its highest mark that year with 18.5 million passengers. Many were new riders who decided to give the train a try due to the 1973-1974 OPEC Oil Embargo and resulting shortages in gasoline. The city transformed two islands in the river—covered with railroad tracks and industrial buildings—into festive fairgrounds. Ten nations, including the Soviet Union, Germany, Canada and Japan, opened exhibitions. The colorful Expo brochure depicted many of the interesting, modern structures built for the fair. One of the most popular landmarks was the tower of the 1902 Great Northern Railroad depot—it was spared while the rest of the structure was demolished to make way for the fair buildings. Accommodations Display from Expo '74. Attendees learned about Amtrak through a mock-up of a rail car that included seating and dining areas. The tables in the latter featured some of the strikingly blue “Amtrak National” china produced by the Hall China Company of Ohio. Amtrak employees were on hand to answer questions about Amtrak, accommodations, destinations and train travel in general. Over the course of six months, more than 1 million people visited the Amtrak display—approximately 20 percent of all fairgoers. In the FY 1975 Annual Report, Amtrak President and CEO Paul Reistrup noted, “It became clear during my travel that there is much to be done. Amtrak had less than 12 percent of the equipment required for a normal day’s operation that was newer than 1950.” To modernize the fleet, the company continued to place orders for new locomotives and rolling stock, including 11 train sets with turbine-powered cars of French design. Referred to as “Turboliners,” four were placed into service in 1975 on routes including Chicago-Detroit and Chicago-St. Louis. An order for 200 “Metroliner-type” cars—soon known as Amfleets—was placed in 1974. By December of the following year, the Budd Company was producing a finished Amfleet car every working day. Tubular in shape and covered in shiny, ridged stainless steel, they would come to define Amtrak in the minds of many travelers. Two hundred and thirty-five Superliner bi-level cars were also ordered in 1975, primarily for use on the western routes. Manufactured by the famous Pullman-Standard Company, they were modeled on the popular Santa Fe Hi-Level cars once used on trains such as the Super Chief. 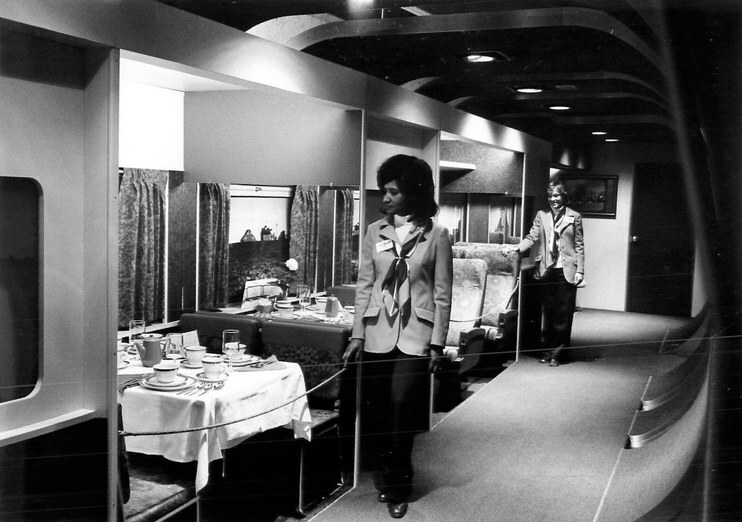 Expanded service was the byword for the mid-1970s. The U.S. Secretary of Transportation—Claude Brinegar, followed by William Thaddeus Coleman, Jr. in early 1975—designated new long-distance routes, including Norfolk-Chicago (Mountaineer) and New York/Boston-Chicago (Lake Shore Limited). States such as Minnesota and Michigan also requested, and supported, services: Minneapolis-Duluth (Arrowhead) and Detroit-Jackson (Michigan Executive). In 1974, five regional reservation centers across the country began to provide 24-hour nationwide toll-free reservations, ticketing and general information—streamlining trip planning for passengers. Amtrak and the intercity bus industry also partnered to extend their reach, with Amtrak proclaiming in ads, “We Can Get You To Places We Don’t Even Go To.” Reservation and information clerks were given information about bus interchange routes to help passengers make intermodal connections. For example, a customer on the Los Angeles-San Diego San Diegan (now the Pacific Surfliner) could catch one of four daily departures to Tijuana, Mexico.